I have one of two expectations for a scent: that it be complex, and develop over time, or that it be simple and linear, more or less unchanging from start to finish. If it's somewhere in between, neither one nor the other, I can't help but feel that the perfumer has failed. Such fragrances usually put all their eggs in one basket, that basket being the opening: the theory, presumably, is that people will sniff it but not actually put it on their skin, love it right from the beginning, and buy it, not realizing until it's too late that the rest of the scent doesn't live up to the promise of the first notes. It's worse when the scent is named after those first notes: buyers will naturally believe that what they smell at the beginning is the fragrance, and they're all too likely to be disappointed when it isn't. 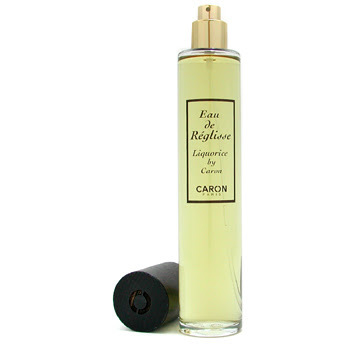 Caron's Eau de Reglisse, originally launched as a limited edition in 2006 but still in production, starts off well enough, with a warm licorice-candy effect ("reglisse" being the French word for "licorice") tied to a cheery--chirpy, even--mandarin orange. It has the innocent glow of early-morning sunshine and it is thoroughly enchanting. After the citrus burns off, the licorice is joined by a slightly abrasive ginger, which would fine if the ginger didn't gradually eclipse the licorice altogether and then peter off in a vague trail of woody warmth that nominally is patchouli but in reality isn't much of anything at all. It shouldn't have been hard to rebalance the scent so that the licorice persisted into the base notes, surely, but the perfumer (Richard Fraysse) took a different tack, and one that just doesn't work very well. Mandarine Tout Simplement was also released in 2006, was also originally a limited-edition scent, and is also still in production. At first breath, you can see why: it's a sharp, brilliant, almost glittering reproduction of mandarin-orange peel, followed in close succession by the softer, pulpier smell of the fruit itself, and it's magic, absolutely realistic and pure joy. But citrus, as it will, disappears quickly, the beneficiary and victim of its low molecular weight, and what remains simply isn't that interesting: a bit of spice, a bit of petal, a bit of wood. Obviously it's impossible to lock citrus peel onto your skin for any length of time, but mightn't there have been some way to carry the mandarin theme into the rest of the scent? (The official description lists three kind of mandarin--green, yellow, and red--and places them respectively in the top, middle, and bottom, like some kind of olfactory traffic light. All I can say, that wasn't my experience of the scent at all, and it sounds like mere advertising nonsense.) I think that in this case, perfumer Olivia Giacobetti was betrayed by her talent for creating light, transparent scents, and made one that works beautifully for about five minutes but not at all in the long run. 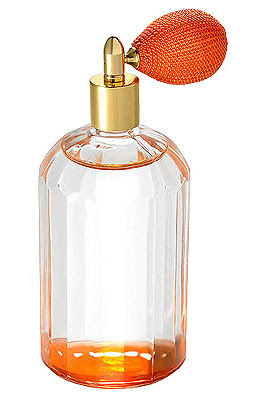 At least Mandarine Tout Simplement comes in a fair-sized vat--200 mL--so if you don't mind the price (currently $125 US), you can blast yourself at regular intervals and enjoy that glorious clementine sparkle over and over again. A friend just bought the Caron last week and has emailed me telling me it smells of lemon and coffee to him, but not of licorice at all. Very strange, and I can't wait to get a sample from him to see what I get from it. I certainly didn't realize it was launched so recently; people often comment on it as if it's been around forever (which, come to think of it, seems to be the way they make everything by Caron sound).